People in India are enthralled with the celebration of the Hindu New Year, the first day of which is today, April 6, 2019. Those following the Lunar calendar consider, Chaitra as the first month of the year. Observed by different names, the festivity continues for a few days with families gathering together to share warm Nav Varsha wishes with each other. While Maharashtrians welcomes the new year by celebrating Gudi Padwa, Kannada New Year is greeted with the observation of Ugadi in Andhra Pradesh, Telangana and Karnataka. The festivity of nine-day celebration, Chaitra Navratri 2019 has officially begun from today. Again, Sindhi community is all slated to celebrate Cheti Chand, their traditional New Year, which falls on April 7 with Saint Jhulelal Jayanti. Since, the nation is engrossed in festivity, Padma Shri awardee, Sudarshan Pattnaik has once again captivated the netizens with his beautiful sand art creation at the Puri beach, Odisha. Extending his heartfelt Gudi Padwa and Ugadi greetings, Pattnaik's art is a great treat to the people in India in their festive mood. Maa Durga Images for Chaitra Navratri & HD Photos for Free Download Online. No celebration in our country can ever be complete, without sharing Pattnaik's amazing and unique creations on the beaches. His enthralling sand arts have only impressed social media users. Just like every other festival, Pattnaik has welcomed Nav Varsh 2019 with delicate artwork. It could not get any better! Tweeting his sand art, he wrote, "Happy #Ugadi / #Gudipadva and wish u Happy New year. 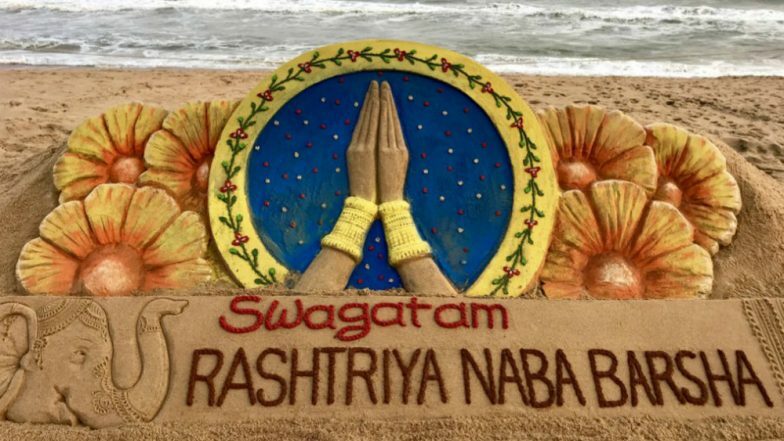 My SandArt with message 'Swagatam #RastriyaNavVarsha' at Puri beach in Odisha." Chaitra Navratri 2019 Ghatasthapana Puja Shubh Muhurat. This beautiful sand art image by Pattnaik has once again won hearts on the internet. People cannot stop sharing and retweeting his wonderful creation. He sculpted beautiful flowers and an elephant's trunk, rightly depicting the festive mood in Odisha, as he carves, "Swagatam," in his artwork. The Hindu communities at every corner today, have adorned themselves in bright new clothes to observe the Nav Varsha 2019. Keeping up their traditions, people will be visiting nearby temples to follow the puja rituals and welcome another new year. After the festivities in these regions are over, people in West Bengal and Assam will gear up to greet their traditional New Year. Bengali communities will celebrate Poila Boishakh, and Assamese people observes Rongali Bihu as they welcome the Nav Varsh 2019.